Oct. 29, 2018 – HAIX North America is excited to announce the release of their newest boot, the Protector Ultra Signal Red. Now you can get better cut protection without sacrificing comfort. Just like it’s sister boot, the Protector Ultra Lime Green, the Protector Ultra Signal Red offers the higher level protection of European Class 2, meaning the boots are tested to a chainsaw speed of 24 m/sec. These boots offer exceptional stability on any kind of uneven terrain while feeling surprisingly lightweight. The steel toe also provides the highest level of ASTM toe protection. 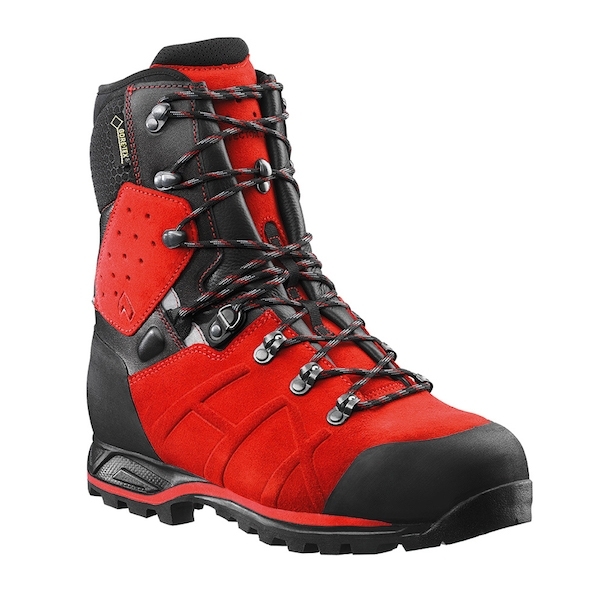 The brightly coloured signal red suede upper works in conjunction with the reflective material at the heel and ankle for increased visibility near the chainsaw both day and night. “We use more colour in chainsaw boots as a function of safety; we want the boots to stand out against an outdoor landscape. This allows the wearer to have a better idea where their feet are in relation to the chainsaw,” says Sandy Longarzo, marketing manager with HAIX North America. The suede upper offers double stitched construction with minimal seaming to yield a longer wearing, more durable boot and less risk of seam failure out in the field. HAIX knows you need to be able to depend on your footwear to perform, especially when far from home. The two zone lacing of the upper allows you to individually adjust the upper and lower lace areas for a customized fit while the roller ball style eyelets make the adjustment quick and easy. Your boot can be adjusted to fit to your own personal preferences. HAIX remains at the cutting edge of technology when developing footwear in order to provide the beset boots on the market.